Samsung’s Galaxy Note 7, the company’s latest addition to its flagship Galaxy series, looks great, is made to take some punishment, and will have longer-lasting battery life than its predecessors. There are even a couple of new bells and whistles to appreciate about the new hardware, which is slated to launch in Canada on Aug. 16. IT World Canada got an early hands-on look at the Note 7 and several of the accessories that come with it. 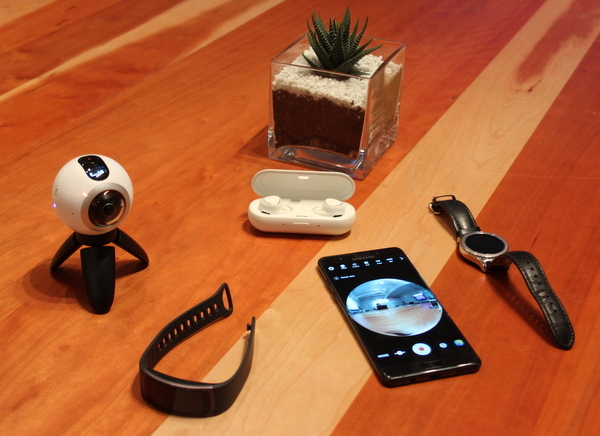 Here are our first impressions, along with some photos of the device in action. Despite the large 5.7″ screen, this sizable phablet felt pretty good in one hand. Granted, I have pretty big hands, but compared to even my iPhone 6S, this felt more manageable. The rounded edges on both sides of the screen have the effect of making this device nestle in your grip quite nicely. It also makes for a great-looking device, as there’s minimal bezel around the screen. But let’s be honest: at this point if you’re shelling out more than $1,000 for a device like this you’re expecting a top-notch presentation. What’s more encouraging to hear is that the Note 7 is more likely to last for a couple of years if you do make the investment. It uses the new Gorilla Glass 5 to offer the best possible scratch and shatter resistance, and has an aluminum backing. Samsung also says the Note 7 has been drop-tested from up to a 1.6-metre height, so it should easily survive a couple of slips from your hand. It’s also water and dust resistant. While I didn’t dunk my demo device in any liquids, Samsung says you could place this in your beer and it’d still work fine. Even the S-Pen is made to the same standard of endurance, so it will survive a soaking as well. 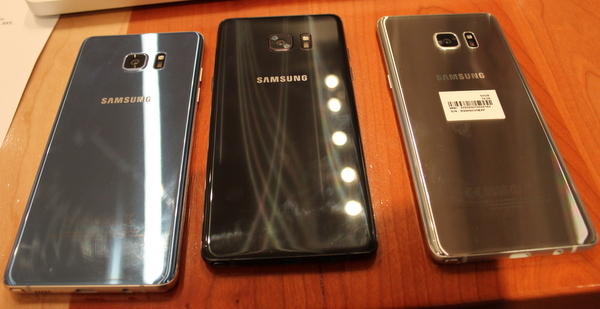 The Galaxy Note 7 will be available in three colours in Canada. There are fancy names, but basically it comes in blue, black or silver. Trying the iris scanner feature, I was surprised by how quickly it registered my biometric signature and then used it to unlock the device. The phone has a typical front-facing camera that is used to scan your iris, and an infrared light sits next to it to illuminate your eye for the camera. An on-screen guide instructs you to hold the device 25-35 cm from your face and line up your eyes with two circles on the screen (you’ll see the camera’s image of yourself). I’d say this is comparable to the speed of unlocking the device with your fingerprint. At launch, the iris scanner feature can be used to unlock the device or access web logins, in the same way a fingerprint can perform this on present Galaxy devices. It can also be used to access the new Secure Folder on the Note 7. In the future, Samsung could work with third-party developers to integrate the iris scanner API and allow it to unlock different apps. But Samsung is going to be very selective about which partners it will work with, given the sensitive nature of biometric information, Samsung’s director of product marketing, Vlastimir Lalovic, says. Lalovic says that as with the digital signature created with a user’s fingerprint, the iris scan data is local to the device and won’t be transferred over the Internet. “We’ve seen growing concerns from consumers about protecting your data,” he says. That’s partly why Samsung is making a “Secure Folder” available. Lalovic points out that this could be useful in an office setting with a BYOD scenario. Users forced to hand their devices over to IT for maintenance or to load on a custom application can maintain their privacy by storing sensitive personal data in a folder that only they can unlock. 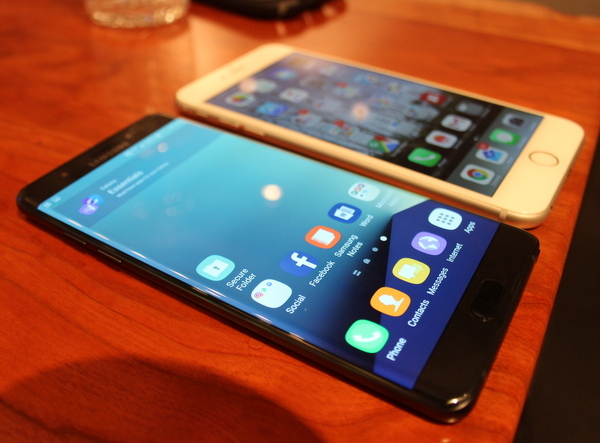 The Note 7 is similar in size to Apples iPhone 6S, also seen here. As someone that’s not yet seen the point of using a stylus with a smartphone, the upgraded S-Pen that comes with the Note 7 felt like a useful tool that had real applications and was fairly intuitive to use. A number of spec points on the S-Pen are improved. Its tip is now a needlepoint-slim 0.7 mm wide, a decrease of 0.9 mm from the last S-Pen. Its latency is 70 milliseconds, and the pressure level has been made more sensitive. A faster scan speed of 360 Hz makes the writing feel more natural. Drawing the S-Pen out from its holster will automatically trigger a menu on your device that will hover over whatever’s onscreen. From there, you can choose among several different functions offered by the pen. Select a portion of your screen to create an image of it and annotate it with a note, or highlight a playing video to make an animated GIF. Hover over a foreign language word to translate it, or just jump to making a new note. A bevy of accessories available for the Note 7 include a 360-degree camera, wireless ear buds, and smart watches. The Note 7 is, of course, compatible with Samsung accessories such as Gear Fit smart watches and the company’s 360-degree camera. Samsung will also be releasing some utility cases for the Note 7. A Backpack power cover provides another 3100 mAH battery for the Note 7 to draw on. It adds a bit of bulk to the device, but still feels relatively slender when attached. I imagine that many power users will make good use of this case. For those who watch a lot of longer videos on their devices, the S View Standing Cover might be the right choice. Pictured in the top image of this article, it provides a cover for the front of the phone that can fold behind it to prop it up for viewing. Those are the broad strokes for our first exposure to the Note 7. We’ll be doing a full review soon, so watch out for that if you’re curious about other details around the new device.